The Applicants must appeared in the CAT 2015 or MH CET 2016 for seeking JBIMS admission 2016. The eligibility requirements and details of the JBIMS registration / application form for the year 2016-2018 are as stated below for your reference. You should read all the information carefully before applying for the JBIMS MMS application form 2016. Applicants passed in qualifying exam in 50% marks (45% marks for OBC candidate). 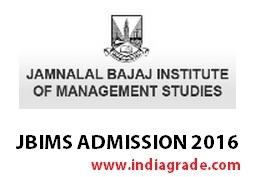 Candidates appearing in the final year examinations can also apply for the JBIMS Admission 2016. Aspirants must have a valid score in CAT 2015 or MHCET 2016 (Indian applicants) and GMAT Exam (NRI and PIO). NOTE: If a candidate has selected two courses means, the application fee will be doubled. candidate and Rs. 950 for backward classes category candidate. This means that if a candidate has selected two courses during the process of registration, he/she will be required to pay an amount of Rs 2400 (for general category, NRI, foreign nationals, PIOs candidates) or Rs. 1900 (for backward class candidates), while submitting the online application form. Candidates should note that the JBIMS Application Form 2016 for management admission is available only through the online mode. Applicants should go through the before filling in/submitting the JBIMS online application form 2016. Candidates needs to completed the application form process within the deadline of last date of the application form submission. You must check all the details entered in the application form before you submit the form. Once you submitted the JBIMS 2016 Application Form means, you will not be able to edit your details. You are advised to you fill the application form from a desktop or laptop. Do not use mobile phone for filling the application form. The best browser is IE 10.0+, Chrome, Safari & Firefox. NOTE: No refund of the application fee will be made if the candidate realised that he/she is ineligible for a particular course. Please do not send printed copies of the application through post, they will not be accepted. You should ensure that the name, D.O.B and gender is the same as it appears on your identity proof. You should check that the contact details entered are recent as the status of your application will be communicated using the details. The preferred Phone Number format is (Phone country code) (Phone Area code) (Phone number) Ex:- 91 221 2345678.